We all salaried Indian individuals willingly or unwillingly contribute to EPF (Employee Provident Fund) as our retirement savings. In case you are doing your financial planning then it is essential to know how much corpus has been generated in your EPF account. 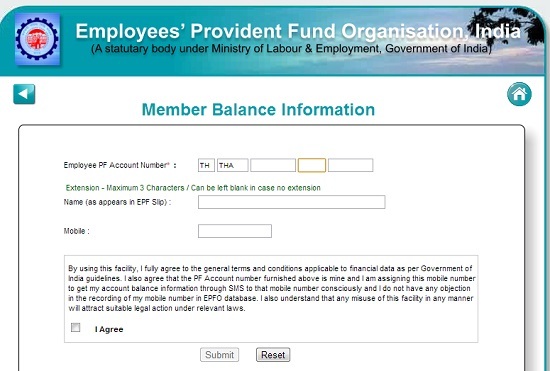 To know what is your EPF balance via a SMS there is a very good service started by the EPF authorities. In order for you to get your EPF account details you must know following things about your EPF account. 2. Indian State in which EPF account is opened. 2. Select the State in which your PF account is opened. 5. Fill in Establishment code. 6. Enter your name which is registered on your PF account (Its very important as it is matched with your PF account number). 7. Enter the mobile number on which you want your balance as a SMS. If everything is perfect you will get an instant SMS with your latest balance. If not check for details on your PF slip which you must have got from your employer. Your EPF balance may not be extremely accurate as it depends when the server was updated with your balance. If you are lucky you might get balance of very recent year. Some people end up getting data which may be 2 years old. The SMS has the details of up to which year the balance is shown.